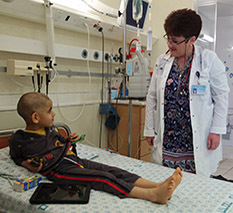 Hadassah pediatric hematologist-oncologist Dr. Polina Stepensky, here visiting a young patient. Photo by Alon Tuval. The impish 4-year-old, she says, was transplanted when he was 3 months old and does not remember her. But the teenage ice hockey player, who was suffering from a severe congenital blood disorder, was 9, and he and Dr. Stepensky formed a close connection. With unflagging enthusiasm, Dr. Stepensky, 48, has headed the bone marrow transplant center at the Hadassah–Hebrew University Medical Center’s Department of Pediatric Hematology-Oncology for the past decade. Round-faced, warm and motherly, she is a medical high-flier. She built her department on the foundations of Israel’s first bone marrow transplant program, which opened at Hadassah 40 years ago, and rapidly brought her team to an international level in transplanting children with malignant diseases. It is, however, with bone marrow transplants in children with nonmalignant diseases, such as combined immunodeficiencies, osteopetrosis (genetic disease of the bones) and bone marrow failures, that she has broken new ground and made Hadassah a global referral center. Genetic sequencing of the family found a damaged gene that prevented correct expression of the TPP2 protein, resulting in premature aging of the immune system. Following a stem cell transplant in 2014, the child has been symptom free. The Hadassah team’s report of this case appeared in 2015 in Blood, the weekly journal of the American Society of Hematology. The article was named one of the journal’s top 10 stories of the year. Performing up to 35 pediatric bone marrow transplants each year, Hadassah’s expertise is well known. With Dr. Stepensky a native Russian-speaker, many of her young patients come from the former Soviet Union, funded by Russia’s largest charity, Rusfond. Bone marrow transplants at Hadassah costs about $200,000—compared to $1 million in the United States. Growing up, Dr. Stepensky strove for 200 percent. At age 19, she went to medical school in Ukraine. Four years later, halfway through her studies, she left for Israel. “I had married Igor, the greatest gift of my life, two years before,” she says. “It was 1990. Perestroika, [Mikhail] Gorbachev’s ‘reconstruction,’ was underway, and we grabbed our chance to leave for Israel. My parents followed a few months later.” They were among the hundreds of thousands of Jews who moved to Israel from the former Soviet Union in the 1990s. The Stepenskys headed for Haifa. Igor, an engineer, found work with Israel’s merchant marines, which kept him at sea for six months at a time. Dr. Stepensky enrolled in the University of Haifa’s Cheryl Spencer nursing school. “People said I had no chance of finishing my medical studies in Israel,” she says. With competition fierce for places in Israel’s five medical schools, without English and limited Hebrew, the advice was probably correct. Four years later, when Dr. Stepensky graduated as a registered nurse, she had upgraded her Hebrew, taught herself English and scored so high on the psychometric exam, Israel’s SAT equivalent, that she was offered a place at the Hadassah–Hebrew University School of Medicine. Dr. Stepensky, her husband, their infant son, Yishai (born during her time in nursing school) along with Dr. Stepensky’s widowed mother, Rachel Bernstein, moved to Jerusalem. Igor quit the merchant marines, and eventually became chief electrical engineer in Israel’s Ministry of National Infrastructures, Energy and Water. With “giving 200 percent” ingrained since childhood, Dr. Stepensky made the dean and the rector’s lists. She also gave birth to a daughter, Yael. Yael is now in her final year of high school. After her army stint, she plans to study psychology. Yishai has just completed his military service with the navy’s elite special operations unit, Shayetet 3. Dr. Stepensky followed her pediatrics residency at Hadassah with a pediatric oncology fellowship under Dr. Yaacov Matzner, then-dean of Hadassah’s medical school, chairman of the Israel Society of Hematology and Transfusion Medicine and a global expert on blood diseases; he died in a plane crash in 2001. “He would say: ‘Our patients have been dealt so bad a hand that whatever we do will help them,’” recalls Dr. Stepensky. While her work involves long hours, Dr. Stepensky’s zeal is undimmed. She has published over 60 papers and collaborates with research teams around the world. Last year, she was awarded prestigious European Union research grants—one for a trilateral and unlikely collaboration between Israeli, German and Palestinian researchers working on congenital diseases of the immune system.